﻿ In the 1840s, wealthy New Yorkers began constructing elegant brownstone homes around the new Gramercy Park. 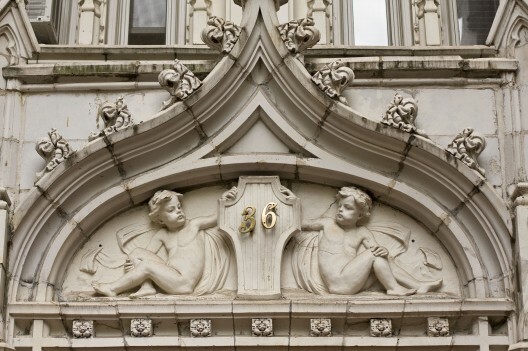 When the ornate 1883 “Gramercy Park Apartments” building was completed at No. 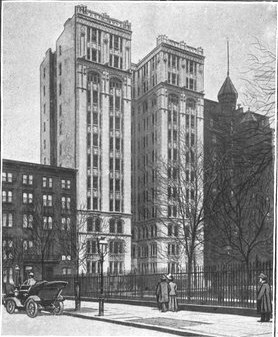 34 Gramercy Park, only the large lot adjoining it to the north was undeveloped. The Sanderson’s Family Hotel had stood here until the 1880s when it was demolished. In 1908 the plot was undeveloped and unsightly. The “capitalist” was John E. Olsen who commissioned James Riely Gordon to design the luxury building. The Texas-trained architect created a 12-story, Gothic Revival structure that melded well with many of the Gothic-inspired brownstone residences around the park of a half-century earlier. Gordon clad the entire building in white terra-cotta which could be easily molded into the ornate Gothic arches, colonnettes, shields, cherubs and gargoyles. The deep central entrance courtyard resulted in a U-shaped building, with the effect of two towers. Above the large cornice of the twelfth floor stylized knights held great shields. The Album listed conveniences such as tiled fireplaces, porcelain washtubs, white tiled kitchens and bathrooms, ventilated garbage closets, safes, telephones, steam heat, mail chutes, gas ranges, shower baths, clothes dryer, both electric and gas lighting, filtered water, a vacuum cleaning system and tile lined refrigerators. A roof solarium, laundry facilities and parquet floors were intended to appeal to potential upper class residents. Apartments sold for $8,900 to $12,000 while some were rented for $2,350 to $3,168 a year. And, indeed, upper class residents were attracted. 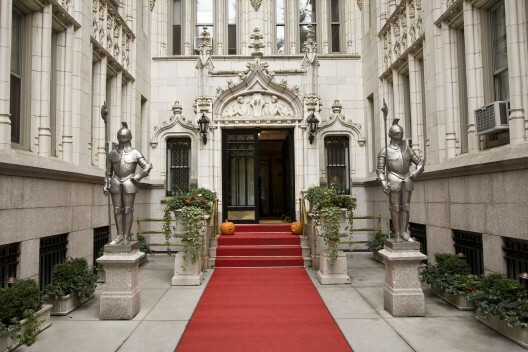 Over the years apartment owners included actor John Barrymore, sculptor Daniel Chester French, circus magnate Alfred Ringling, and write Eugene O’Neill. Other well-to-do residents appeared regularly in the society pages hosting receptions and dinners. The cooperative, called the Gramercy Park Club, owned the building until its bankruptcy in 1946. The apartment house was sold and the units became rentals. 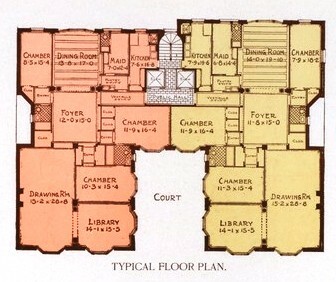 Where there had once been 24 roomy apartments there were now 53; the grand spaces that had included libraries and maid’s quarters were reduced to a more modern scale. Despite its prestigious location and visual appeal, No. 36 would eventually feel its age. In November 1971 tenants took to the sidewalks, picketing in front of the building protesting “the living conditions they get in return for rents of $500 or $800 a month,” according to The Times. 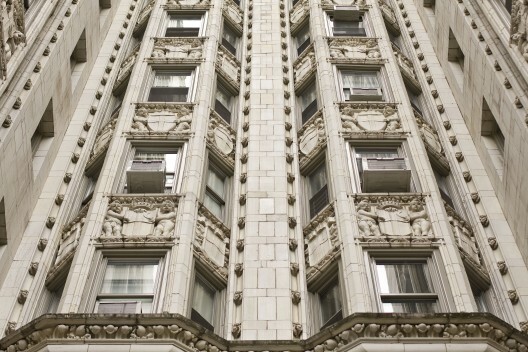 In 2003 the building's new owners began renovation, cleaning and polishing the marble lobby walls, replacing the old elevators and rejoining some of the cut-up apartments. Despite the changes, when condominium offering plans were issued to the residents in January 2009, some residents were still unhappy about the condition of the building. One tenant complained of “old water pipes and fluctuating temperature while showering” and of the need to carry garbage to the basement trash bins. The offering listed apartments ranging from 2,078 square feet at over $6.5 million to a tiny 323 square feet at $484,500. By late 2010 thirteen apartments had sold while renovations and upgrades continued. The incredibly ornate No. 36 Gramercy Park East remains an architectural jewel and a grand example of the heyday of terra cotta age in the early 20th Century.